Botgirl's Digital Playground: Is 'Patterns' Linden Lab's Upcoming New Product? Is 'Patterns' Linden Lab's Upcoming New Product? 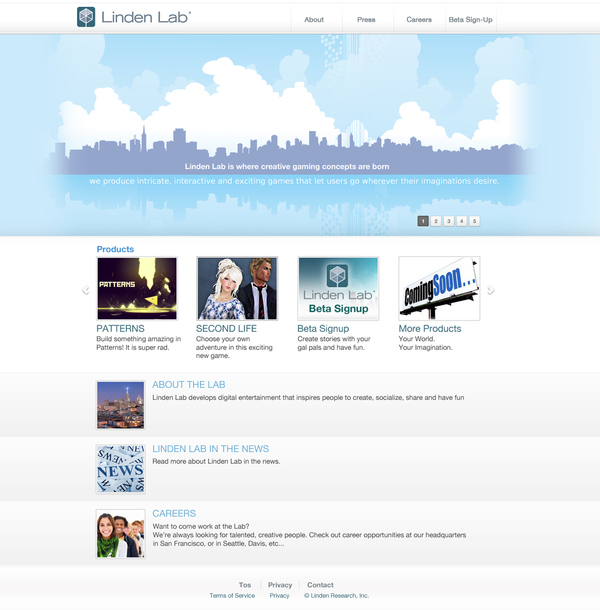 A name and tagline for a new product appeared in an image that appeared briefly on the Behance Network under the title, "Linden Lab Redesign on the Behance Network." It could be just a fabricated placeholder, but it looks like an actual product to me. What do you think? Looks real. Who the hell else would use the tags line "It's super rad!" Those look like placeholders on a prototype design to me. "Create stories with your *gal pals* and have fun." Can I just say right now that it is UNBELIEVABLE how happy I am that I sold off all my mainland and became a Basic customer again this month? It will be interesting to see what the actual story on this is.